Since Jane ate the Beef Stroganoff at TGIFridays a few months ago, she’s made numerous request for me to make it at home. After browsing a few websites and looking at my cookbooks, there are so many variations and ways this dish can be prepared. There are also easy and quick ways to prepare this dish as well as long slow-cooked versions. For my dish, I added some minced garlic, Thai chilies and Cream of Mushroom to satisfy my taste buds. The creamy gravy-texture of the sauce is fantastic! I’m actually thinking of making this sauce in the future if I ever make Chicken Fried Steak or Loco Moco again. While cooking, I was curious about the origins of Beef Stroganoff. 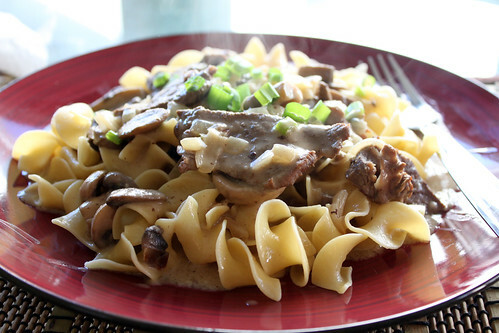 Since most Beef Stroganoff recipes are served with wide egg noodle pasta, I thought it might be an Italian dish, but I never actually seen it identified as being Italian anywhere. Most of the time, I see it served at diners so I was thinking maybe it is American diner food. As I am blogging, I looked it up on Wikipedia and Beef Stroganoff actually originated in Russia during the 19th century, possibly named after the Strogonav Family. The Strogonav Family was a family of highly successful Russian merchants, industrialists, landowners, and statesmen of the 16th – 20th centuries who eventually earned nobility. Today, variations of the dish can be found all over the world. I used the instructions from my America’s Test Kitchen Family Cookbook to cook this recipe. It seems like this way of cooking took a little longer than the recipes I saw online, but I think it was worth it since it focused on bringing out tons of great flavor from the beef and the mushrooms. Heat 4 quarts of water, add 1/2 tablespoon salt and cook wide egg noodle according to the cooking instructions on the package. Slice beef tenderloin to about 1/4 inch slices, pat dry with paper towel and season with salt and pepper. Dice yellow onions, mince garlic, and mince Thai chilies and put in a bowl. 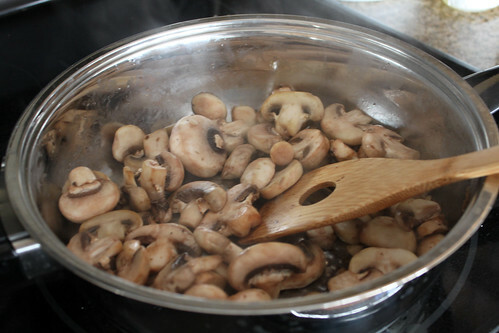 Prepare sliced mushrooms and put in a bowl. Add 1 tablespoon of oil and begin browning slices of beef tenderloin. 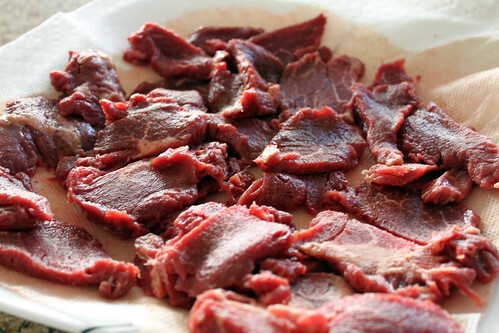 Depending on how much beef you have, you might need to cook it in 1-2 batches. After beef tenderloin is done cooking, transfer it in the bowl with the mushrooms. Add 1/4 cup of white wine to the skillet and begin scraping up the browned bits for about a minute. Transfer the wine and browned bits to the beef and mushroom bowl. Add 1 tablespoon butter to skillet and begin sauteing onions, garlic, chilies, and brown sugar for 5 minutes or until onions are browned. Stir in flour and continue cooking for another minute. Whisk chicken broth, beef broth, juices from the beef and mushroom bowl, and let simmer for a few minutes. Take some of the juices in the skillet, add to bowl of sour cream, mix it up, and pour it into the skillet. Add cream of mushroom and continue whisking/stirring until smooth. Season to taste and let simmer for another 5 minutes. Add beef and mushroom to the sauce and allow to simmer for another 5 minutes. 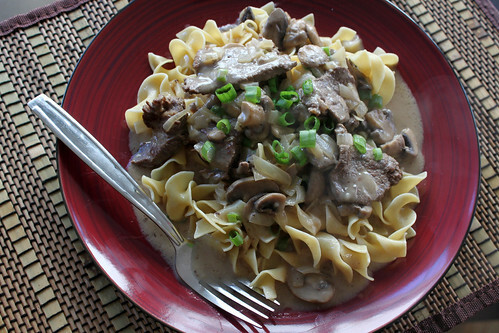 Serve Beef Stroganoff over bed of wide egg noodles and garnish with diced scallions or parsley. NOTE: According to the ATK Family cookbook, Sour cream can curdle if added directly to hot liquid. To prevent that from happening, stir 1/2 cup of the liquid from the sauce to the sour cream and then pour sour cream back into the sauce.